Initially when I developed this recipe, it was for a contest to win a year's supply of eggs from our local Hickman's Farm eggs. I have teenage boys, so I thought it would be a good fit. I actually got really busy with work and didn't ever send in the recipe but I decided that with the changes in my life and things happening so quickly around here to launch a cafe, that this would be a good recipe to add to the menu. What do you think? Mind you, I really won't give the full recipe for the menu here on the blog. I have to have some secrets. However...I think that sharing this will make a few of you hopefully think about coming down to see us! Seriously, until we get our permits, I can't share the menu at all! This is a savory stuffed French Toast sandwich. If you can, use bread made from our simple recipe for No Knead 4 Ingredient Overnight Bread Anyone Can Make. 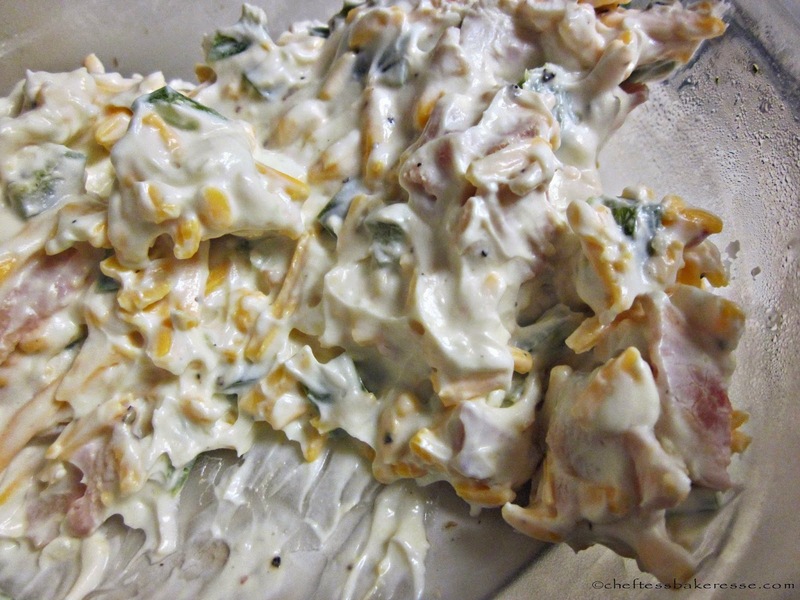 Between two slices of thin French bread there is a remarkably savory filling made with cream cheese, bacon and jalapeno with a hint of garlic and sharp cheddar cheese. 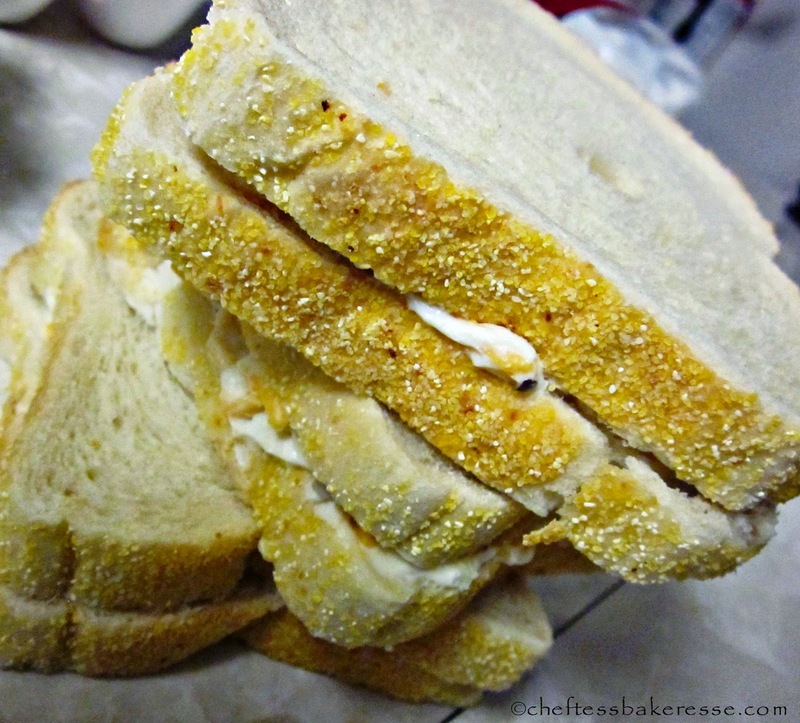 The sandwich is dipped in a savory egg coating and then covered with a crispy cornflake-Parmesan layer. 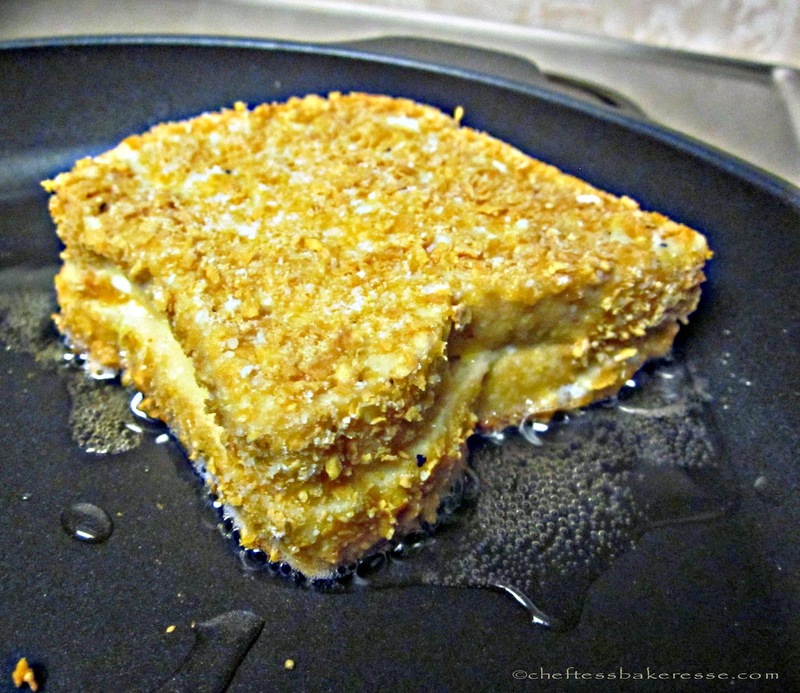 When the sandwich is pan-fried it is remarkable. 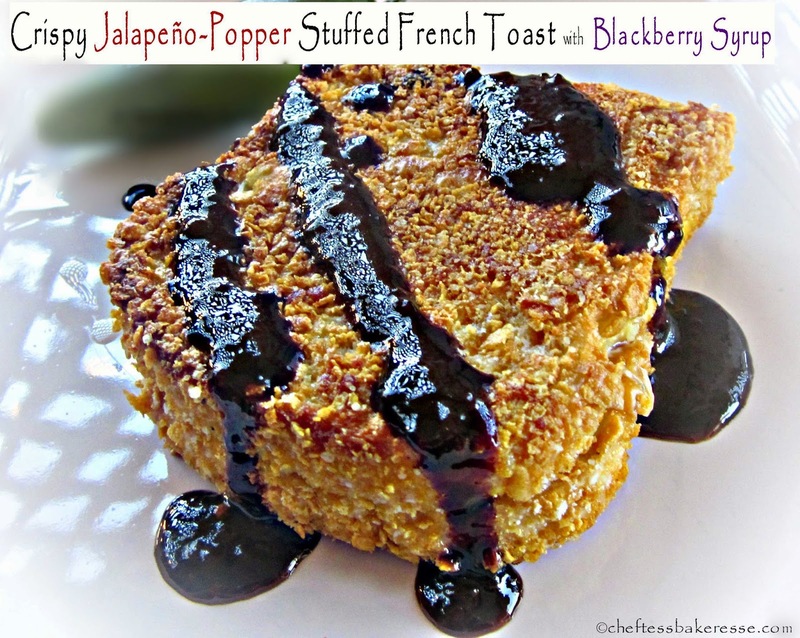 Warm and crispy from the pan and oozing with the jalapeno-bacon and cheese mixture, it is drizzled with a savory-sweet blackberry black-pepper syrup. I think it is probably the best breakfast sandwich on earth. You will also need 12 slices thin sliced sourdough French Bread (depending on how large the slices, usually about 4 inches by 4 inches). Fill slices of bread generously with filling, enough to make approximately 6 sandwiches. One for my family to share. The rest for me. 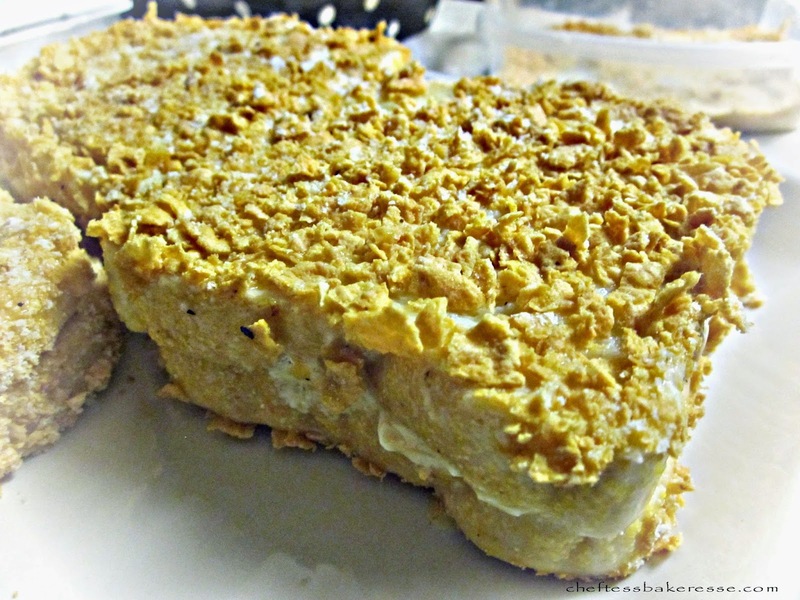 In a container the size of the sandwiches, combine the cornflakes and the Parmesan. 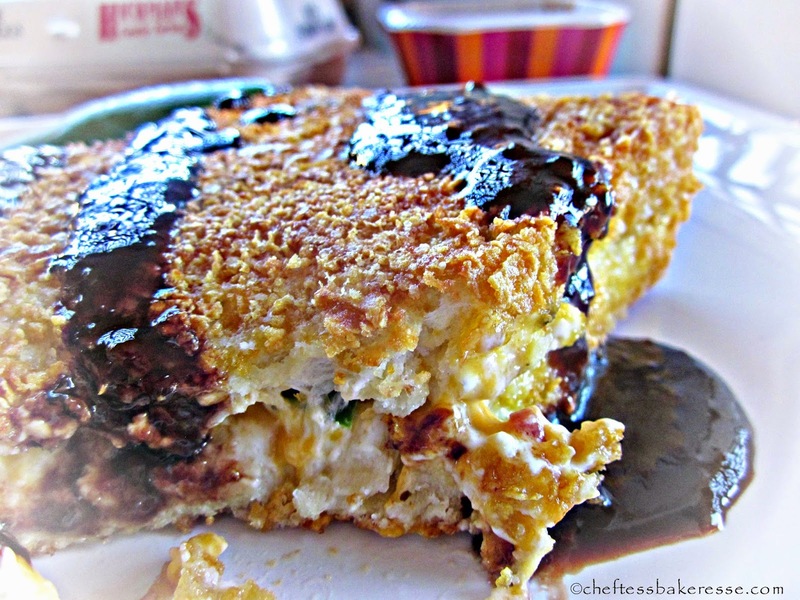 In a separate container combine the ingredients for the egg coating. set up a dipping station. 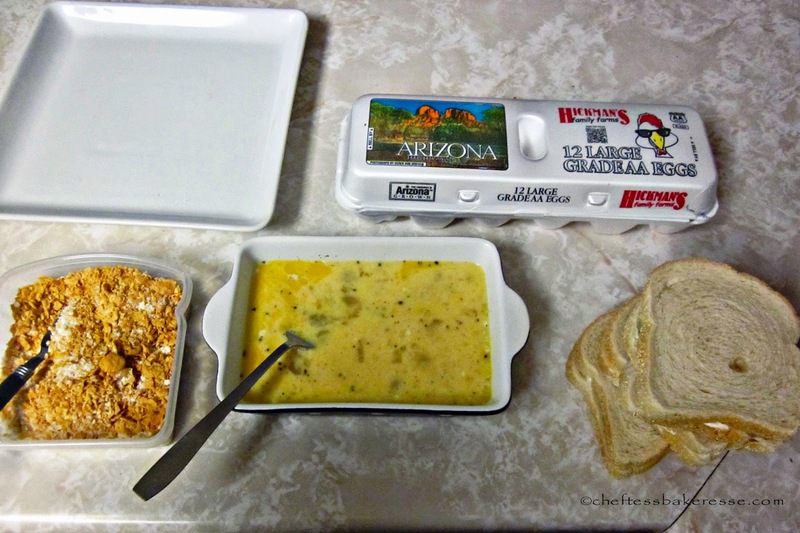 Dip the sandwich in the egg mixture and coat well. 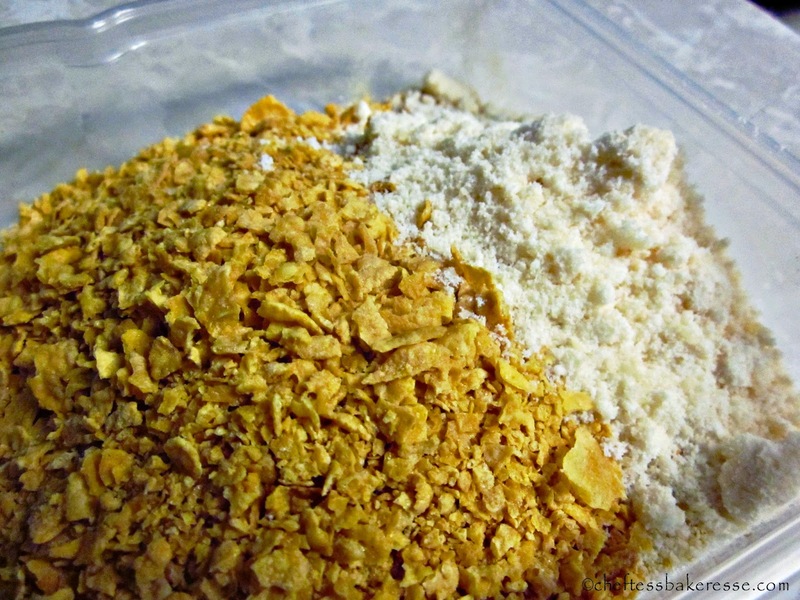 Then coat with the corn flake mixture. Continue until all the sandwiches are coated. In a large skillet over medium high heat, cook the sandwich in a few Tablespoons of bacon fat or vegetable oil. Prepare the blackberry syrup by combining all the syrup ingredients and stirring until smooth. Drizzle over the warm toast. There you go my darlings. More amazing ideas to come. This sounds just incredible! I can hardly wait to experience your awesome treats up close and in person! So happy for the windows that have opened since that door closed a while ago. God is amazing! Congratulations on the exciting opportunities ahead for you! You are BRILLIANT! This looks amazing and I can't wait to try it! Super excited for your new job too - you are going to make a lot of people's mouths very happy :)!